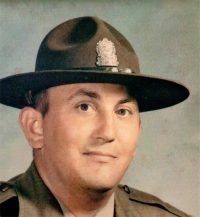 Eddie was a patriot and retired as an Illinois State Police Officer. He was a United States Army Veteran having served during the Vietnam War. He was an active member of the Crossville Missionary Baptist Church and a member of the Masonic Lodge. Eddie was a music lover and enjoyed singing. Gardening, yard work, being a jokester and spending time with his family were among his favorite pastimes. Survivors include his wife, Cecilia A. Paris of Crossville; son Michael Paris of Crystal Lake, Illinois; daughters Dee (Chris) Rose of Wolf Lake, Illinois, Heather (John) Morgan of Scottsdale, Arizona; sons by marriage Joe (Lisa) Funkhouser of Orlando, Florida, Brad (Cheryl) Funkhouser, Andrew (Amy) Funkhouser, all of Grayville, Illinois; grandchildren Jayson Rose and Nicholas Rose; nine grandchildren by marriage; one great grandchild. He is preceded in death by his parents, Chinker and Mina Paris. Visitation and funeral are Saturday, April 6, 2019, at the Crossville Missionary Baptist Church in Crossville. Visitation is noon to 2 pm, and funeral is at 2 pm. Burial with military rites will be in Oak Grove Cemetery in Grayville. Memorials may be made to St. Jude Children’s Research Hospital, 262 Danny Thomas Pl, Memphis, TN 38105, or Shriners Hospitals for Children, 2900 North Rocky Point Drive, Tampa, FL 33607. Donations will be accepted by Cook Funeral Chapel who is in charge of all arrangements. So very sorry. Ed was at very good friend and colleague, worker. Will be missed.